Hey readers! I’m Elizabeth, your new culinary contributor. I’m a Hamilton College and French Culinary Institute graduate, and a longtime NJ resident. Even with my highbrow culinary education, I still enjoy a bowl of Kraft Mac & Cheese and a slice of Funfetti cake as much as the next food lover (my French chefs would cringe!). You’ll find me sampling and creating all kinds of food from all types of cuisines; cooking, baking, cocktail shaking – the works. I also write healthy living recipes for insurance companies; so I’ve got lots of gluten-free, dairy-free, and veggie-laden recipes in my repertoire. I love traveling, spicy food, farmer’s markets, champagne, and throwing dinner parties for friends and family. This Valentine’s Day, why not forgo the expensive pre-fix menu and overcrowded restaurant in favor of a delicious dinner at home. This pappardelle pasta with lamb ragu comes together quickly and makes your kitchen smell delicious. Its light on your wallet but still packs big gourmet flavors to celebrate the night. Serve with a green salad and red wine, and you’ll be sure to please! In a large cast-iron skillet or Dutch oven, the oil over medium heat. Add the carrot and the onion and cook over medium heat, five minutes or until the vegetables have begun to soften. Add the garlic and the mushrooms and cook for a minute more. Next, add the lamb, parsley, fennel, cinnamon, rosemary and thyme. Cook for five minutes, stirring often. Add the tomato paste and the wine and cook until mostly evaporated, 5 minutes. Add the tomatoes and their puree, and bring everything to a boil. Lower the heat to medium low, cover your pan partially and cook until the liquid is slightly reduced, 25 to 30 minutes. If your ragu gets over-reduced, add a splash of chicken stock to thin it out again. Season with kosher salt and black pepper to taste. In a large pot of boiling salted water, cook the pasta until al dente, per package directions. Save 1 cup of pasta cooking water, then drain the pasta. Add the pasta to the sauce, along with the butter and toss over low heat. Thin the ragu with a splash of the pasta water if needed. Serve the pasta and ragu in bowls, topped with a scoop of the ricotta and a sprinkling of the chopped mint. As a bonus- toast the night with a festive fizzy cocktail. Pick budget friendly Prosecco over pricey champagne, and mix it with 1-tablespoon pomegranate juice per glass. Serve in champagne flutes with a squeeze of lime juice and enjoy! 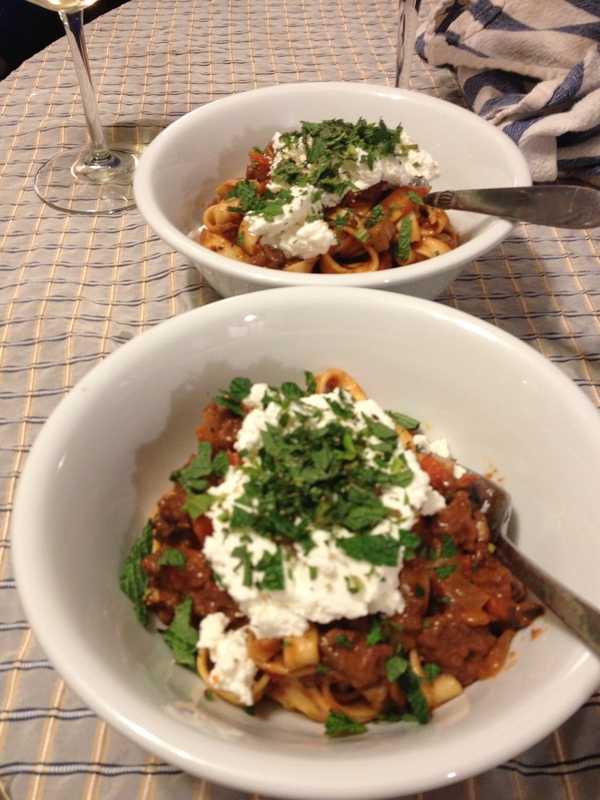 This entry was posted in DIY, Elizabeth Palmer Starnes, healthy, holidays, homemade, Recipe, recipes, SCBD, Small Chick Big Deals, yummy and tagged culinary, dinner, diy, elizabeth palmer starnes, homemade, pappardelle with lamb ragu, recipe, romantic, scbd, small chick big deals, valentines day by elizabethpalmer14. Bookmark the permalink.